An independent management consulting organization of nine partners specializing in business strategy and innovation. Paul White has consulted with corporations and not-for-profit organizations in Canada, the U.S.A., Europe (Eastern and Western), Russia, Armenia, Serbia, Kazakhstan and Australia. He has traveled to over 60 countries and has conducted project work in 24 countries. Most recent professional work includes working on strategic issues for the Missanabie Cree First Nation, a major pet care business, and a community association. Commencing his career as an industrial engineer concerned with productivity and performance improvement, Paul has since focused on assisting clients in their development of a business strategy and addressing corporate innovation issues. Managing Director, Hatch; an international consulting engineering company headquartered in Mississauga, Canada. 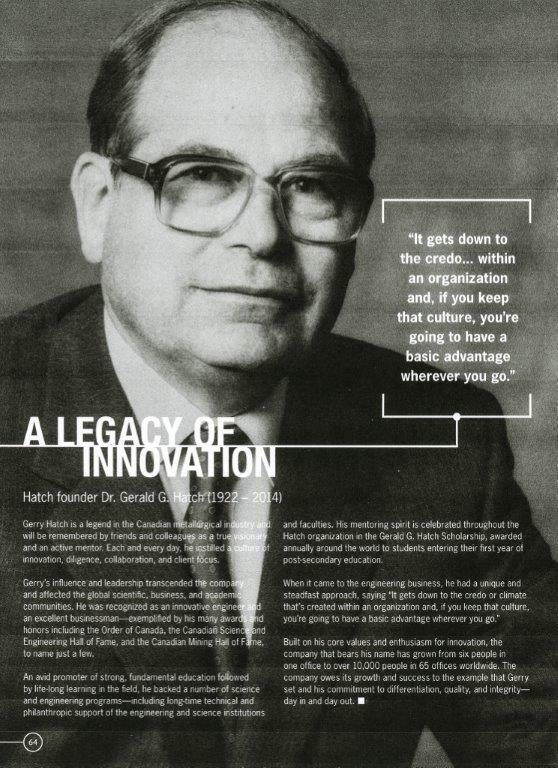 As the Founder, Gerry Hatch, left a legacy of innovation. 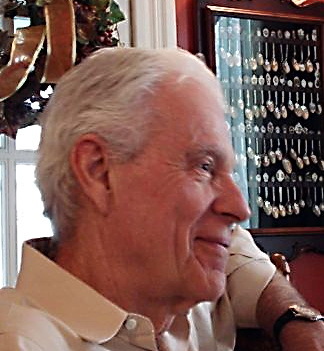 President of Arthur D. Little Canada Ltd., at the time the oldest management and technology consulting company in the world, headquartered in Cambridge, Massachusetts, U.S.A. Partner and Director of Currie, Coopers and Lybrand (previously known as Urwick, Currie & Partners). Early in his career he worked for IBM and Massey Ferguson in Canada and in the U.S.A, and with Metropolitan-Vickers Ltd. in Manchester, England. He was awarded scholarships for study in the U.K. and at the University of Western Ontario, London, Ontario, Canada. service, as a Board Director, on a number of not-for-profit organizations engaged in the arts and social services. He is a Fellow of the Institute of Certified Management Consultants of Ontario and holds the following academic and professional qualifications; B. Sc., M.B.A., P. Eng., FCMC. He is a graduate of the University of Manitoba, the University of Western Ontario, and a diploma course at the Massachusetts Institute of Technology. Richard Blayden, Brisbane, Australia, is a professional engineer with over 30 years international experience in guiding business improvement activities in capital intensive industries. Download his paper on collaboration Enabling Improvement by unleashing the Power of Collaboration. He has a significant track-record (read his Reflections on Maintenance Past Present and Future) of successful innovation in methodologies, business processes and associated software tools together with expertise in the human aspects of facilitating organisational change to ensure successful implementation – Download Encouraging Differences and Discussion to Germinate New Ideas. Now retired and working part-time, Richard was previously an Associate and Principal Consultant with Hatch Associates, Australia. Joaquim Vila, Barcelona, Spain, Professor of Strategic Management and Innovation at IESE Business School, University of Navarra, draws on a recent study by IESE and Capgemini to conclude that the existence of a formal process for steering and governing innovation is closely linked to the success of that innovation. Download Normalized Innovation JVila . In a second paper he presents his ideas on “Regenerating the family business for continued success, even in times of crisis”. The experience of Planas, a supplier of the construction industry in Spain, is presented. Access this interesting paper. Innovation to regenerate family businesses. Two recent papers; Normalizing innovation and the second on how to Innovate in mature industries are must reads. Peter Farwell, Toronto, Canada, FCA, CFA. Peter has a B.A. (Maths and Physics) from the University of Toronto, and for one year studied philosophy at the University of Cambridge. Peter’s work experience includes being a Partner of the Public Accounting firm of Ernst & Young (formerly, Clarkson Gordon) from 1970 to formal retirement in 1998. During that time, Peter managed the Toronto Tax practice for six years, managed a group serving entrepreneurs, to help them build businesses, for three years and was the leader of the firm’s Canadian services to technology companies for twelve years. Peter Farwell’s Resume. Check out Peter’s comments on IBM – can it survive? Dr. Antonio Arcienaga, National University of Lomas de Zamora, Institute for Knowledge and Innovation Management and, Lic. Conrado Gonzales, Foro do Ciencia y Technologia para la Produccion co-authored, with Paul White, the paper on Argentina’s innovative capacity. Download Argentina Arriving].